Discounts are available for 5-I dC! 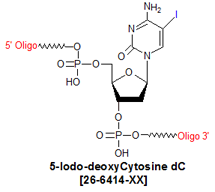 5-Iodo deoxycytosine (5-I-dC) is classified as a halogenated nucleotide, and is primarily used to facilitate the determination of DNA structure by X-ray crystallography (1). When incorporated into a DNA molecule, the multi-wavelength anomalous dispersion (MAD) technique can be applied to obtain the phase information necessary to correctly calculate the electron density for the unit cell of the molecule under study. Because the MAD technique allows for the measurement of all the diffraction data with the same sample, is a much simpler to use than the traditional multiple isomorphous replacement (MIR) method for phase determination, which requires the synthesis of, and collection of diffraction data from, multiple heavy-atom isomorphic derivatives of the original molecule (2). Halogenated nucleotides are also photo-labile, and can be used in UV-crosslinking experiments to investigate the structure of protein-DNA complexes. For example, 5-I-dC (or 5-I-dU) was incorporated into a set of 14-base oligos for cross-linking studies of these oligo sets with the Ku protein, a DNA repair protein that binds to broken DNA ends and thus triggers a double-strand DNA break repair pathway (3). The researchers in this case took advantage of the fact that iodopyrimidines cross-link with amino acid residues in close contact with the C5 position of thymine or cytosine in the major groove of DNA (4). An intriguing use of 5-I-dC is as a post-SELEX modification to convert a SELEX-identified aptamer into a photo-aptamer (5). In this case, 5-methyl-dC serves as a non-photoreactive �placeholder� in the candidate nucleotide mixture used for aptamer selection during SELEX. One or more of the 5-methyl-dC nucleotides is then replaced by photo-labile 5-I-dC to generate the corresponding photo-aptamer. Because substitution of iodine for methyl at the 5-position of the base does not significantly change the steric properties of the oligo, the photo-aptamer typically has nearly the same binding affinity for the target as that of the (non-photo-reactive) original. 1. Hendrickson, W.; Ogata, C. Phase determination from multiwavelength anomalous diffraction measurements. Meth. Enzymol.. (1997), 276: 494-523. 2. Walsh M.A. ; Evans G.; Sanishvili R.; Dementieva I.; Joachimiak, A. MAD data collection - current trends. Acta Cryst. (1999), D55: 1726-1732. 3. Yoo, S.; Kimzey, A.; Dynan, W.S. Photocross-linking of an Oriented DNA Repair Complex. Ku Bound at a Single DNA End.J. Biol. Chem. (1999), 274: 20034-20039. 4. Meisenheimer, K.M. ; Koch, T.H. Photocross-linking of nucleic acids to associated proteins.Crit. Rev. Biochem. Mol. Biol. (1997), 32: 101-140. 5. Schneider, D.J. ; Wilcox, S.K. ; Zichi, D.; Nieuwlandt, D.; Carter, J.; Gold, L. Improved SELEX and Photo-SELEX. (2008), PCT/US2008/070371 (WO/2009/012410).